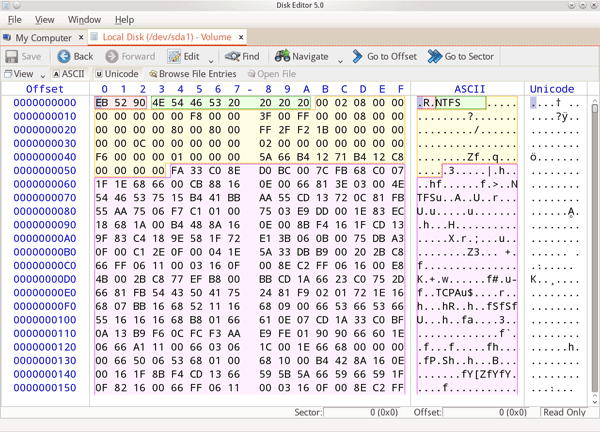 Active@ Disk Editor is a utility created to help you in editing a disk's raw sector data. 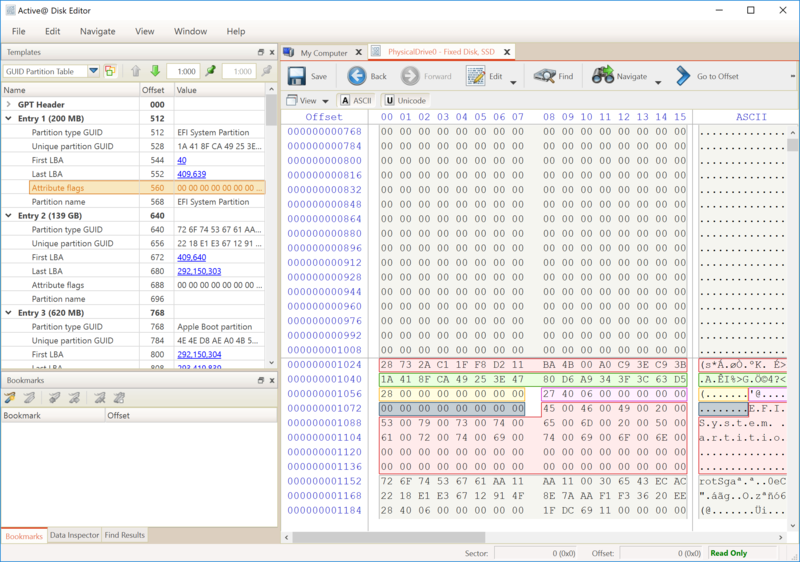 The editor displays information in binary and text modes at the same time. You can use this view to analyze the contents of data storage structure elements such as hard disks and partitions. The Open Disk dialog box displays a list of available storage devices and a list of logical drives. The Data Inspector displays whatever is currently under the cursor. It does so in ten different formats. This can help you interpret data as displayed in Hexadecimal View. If you choose to view the Data Inspector, the window always appears docked to the left panel when you are using Active@ Disk Editor. A destructive virus can damage the MBR (Master Boot Record) and make it impossible to start the computer from the hard disk. When you start the computer, the code in the MBR executes before the operating system is started. If the MBR is corrupted, the operating system cannot start. The location of the MBR is always track (cylinder) 0, side (head) 0, and sector 1. You may use Active@ Disk Editor to repair a damaged MBR. 1. From the Active@ LiveCD shell, click Start > Favorites > Active@ Disk Editor. Disk Editor device panel opens. 2. Right click on a device or a logical drive to select it. 3. Click Open. The Active@ Disk Editor workspace appears. Click either the hexadecimal area or the text area to focus on it. Use the scroll bar, keyboard arrows or the mouse wheel. 5. To toggle the focus between hexadecimal and text panes, press TAB. When you start Active@ Disk Editor, the default view shows the Info Pane on the right and the editing pane on the left, with a Status Pane across the bottom. You can change the default configuration of the workspace so that it opens each time with your custom settings. 1. In Active@ Disk Editor, click View toolbar button. The drop-down list of available views appears. To hide the Templates Pane, clear the Templates check box. To show the Templates Pane, select the Templates check box or you can simply click on View-> Windows and click on templates. 3. To change the default size of the font in the editing pane, select a size from the Text size drop-down list. 4. To toggle the display of the current address offset between hexadecimal and decimal, from the View menu, choose Hexadecimal Offset. a. Click Open Disk from File menu, or press Ctrl+O. The Open Disk dialog box appears. b. Click a device or a logical drive to select it. Click Open. c. The Active@ Disk Editor workspace appears. a. From the Navigate menu, choose Go to Offset or Go to Sector. The Go to Offset/Sector dialog box will open. b. To jump to a named offset, type the offset value as Decimal. Use a prefix 0x to use hexadecimal values. c. To jump to a named sector, in the Sector field, type the sector number. To jump to a named cluster, in the Cluster field, type the cluster number. d. Click Ok. The sector/offset appears in the editing panel. 3. To jump to the volume boot sector, from the Navigate menu, choose Boot Sector (0). The boot sector appears. 4. To jump to the partition table, from the Navigate menu, choose Partition Table. 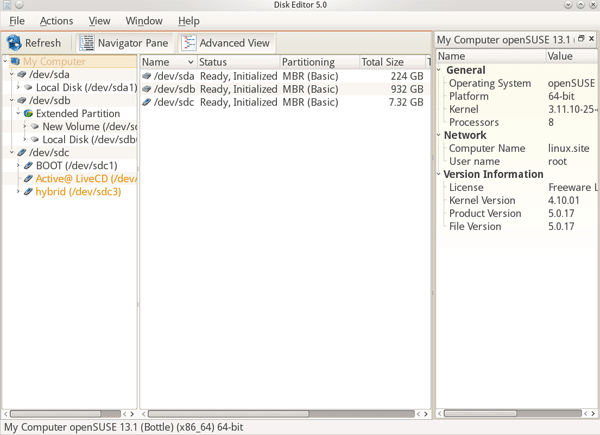 The partition table sector appears in the editing panel. Note! This only applies for physical drives (HDDS, SSDs, etc) and not logical drives such as partitions or volumes. a. 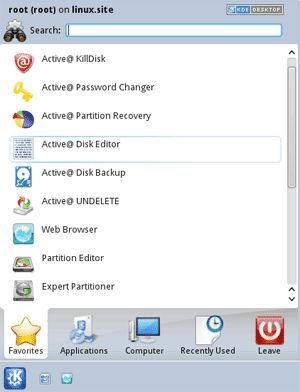 From the Navigate menu, choose Partition Table. Navigation will be positioned to the sector 0, and Master Boot Record template is applied. The Signature (55 AA) at the end of zero sector marks the end of the Partition Table. b. Review the settings for partition table entries 1, 2, 3 and 4 in a Template View at the left side. c. Turn on edit mode (Ctrl+Alt+E) and modify partition table parameters. d. To save changes, click Save. 6. From the Navigate menu, you may jump to many named sectors. These sectors are listed with the sector name and a number that is unique to your hard drive. To jump to the unallocated boot sector, from the Navigate menu, choose Unallocated (<your partition size > GB) > Boot Sector (your sector number). To jump to the boot sector, click Boot Sector (your sector number). The primary boot sector appears in the editing panel. To jump to the boot sector copy, click Boot Sector Copy (your sector number). The primary boot sector copy appears in the editing panel. To jump to the MFT (Master File Table) sector, click $MFT (your sector number). The MFT sector appears in the editing panel. To jump to the MFT mirror, click $MFT Mirror (your sector number). The MFT mirror sector appears in the editing panel. You can paste code or text from the Windows Clipboard. Use these tools to copy and paste selected code. 1. To toggle whether or not to allow editing in the editing pane, from the Edit menu, choose Allow Edit content. a. Click anywhere in a navigation view. b. From the Edit menu, choose Select All which will therefore select the whole area. 3. To select part of a sector, click and drag the cursor over some code. You can select the code this way in either the HEX area or in the text area. 4. To copy HEX data, if you have selected code in the HEX area, from the Edit menu, choose Copy Formatted and selected HEX data will be copied to the Clipboard. 5. To copy text data, if you selected code in the text area, from the Edit menu, choose Copy. Selected text data is copied to the Clipboard. a. Click the cursor in the area where you want to paste data. b. From the Edit menu, choose Paste. The data appears. 7. To discard all changes that you have not saved yet (if any were made) and roll back settings to the way they were at the last save, from the Edit menu, click Revert Changes. 8. To save changes, click Save. Note! By default, you cannot edit content in Active@ Disk Editor. You must choose Allow Edit Content in the Edit menu in order to change the code. Note! For detailed instructions, see the Active@ Disk Editor Documentation.